Kate chose a Japanese Import from her stash. The Mailbag is a simple and easy pattern to follow. A great option for sorting your postal deliveries. 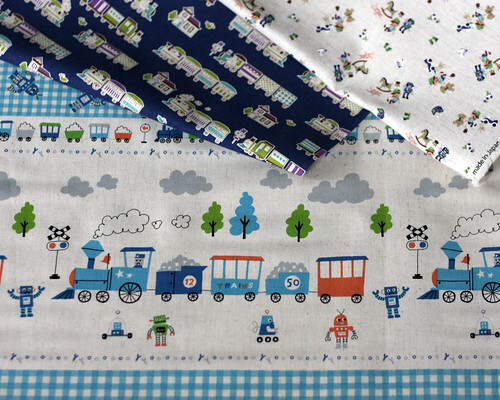 Here’s a fun selection of train fabrics currently in stock. Great for train/robot loving boys! 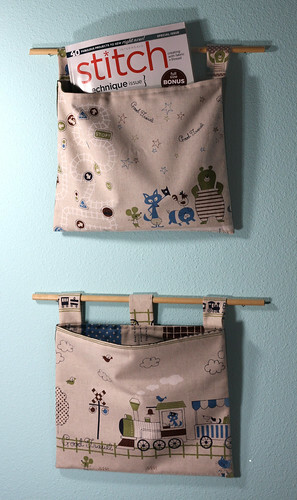 The book suggests using a ribbon or pretty hook to hang the mailbag. We used a dowel which gives the mailbag more stability. Kate enjoyed the project so much she made another one just for fun! (Can you tell the Pink Chalk Team loves Soul Blossoms?) 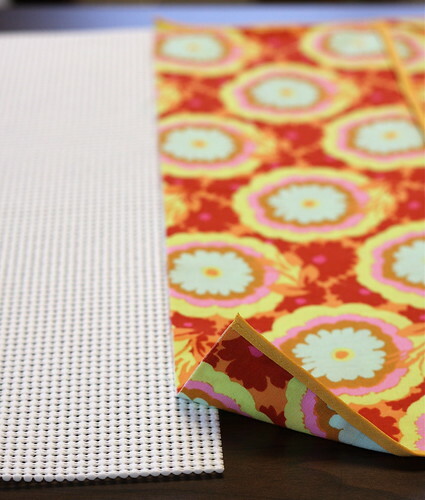 Kate recommends using interfacing with lighter weight fabrics. Cindy chose Amy Butler Soul Blossoms Buttercups in Honeydew. The organizer slips between the mattress and box spring and is held in place by rubberized shelf liner. 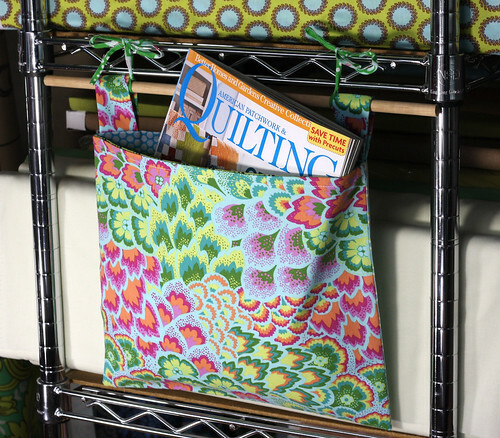 A great place for your books, magazines, glasses or even an MP3 player. 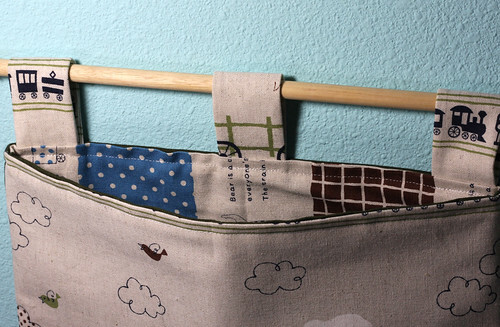 Step 5 – Add the Liner – See photo to clarify how to attach the shelf liner to the bed pocket. 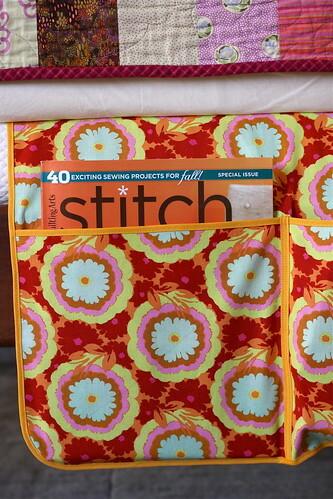 Lay the seam binding on top of the overlap and stitch 2 rows over binding for strength. Be sure to use a new heavy duty needle. Sewing through the thick shelf liner will be much easier. For a thick project like this a walking foot would be helpful. Both of this week’s projects will assist you in getting organized in the new year. 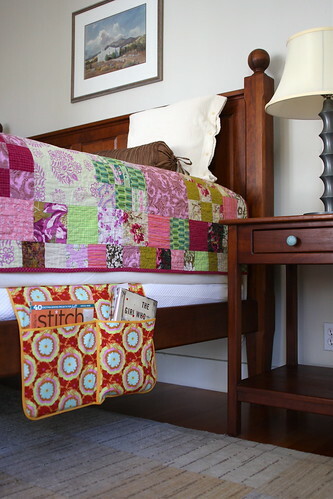 The quilt in the Bed Pocket photo is “The Leafy Rosy Quilt” from Glorious Patchwork by Kaffe Fassett.